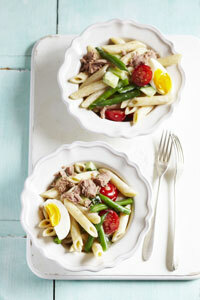 A tasty twist on the classic French Nicoise salad. 1 Cook the pasta in boiling salted water for 7 mins. 2 In a separate pan put the eggs into boiling salted water, return to the boil and cook for 8 mins. 3 Add the beans to the pasta for the last 3 mins or until just tender. 4 Drain the pasta and beans. Run the hard-boiled eggs under cold running water, then cut into quarters. 5 Put the pasta, beans, tomatoes, tuna and dressing in a large bowl, season and stir to mix. Top with eggs to serve. Tip: We used John West no drain tuna in a little sunflower oil, to save time.